Hurry up camping season will be over just kidding.I have been wanting a tent like this for the top of my cherokee.Everything I've seen is in the UK.What will be the estimated cost and will it have a rain fly? We are trying to get the pop-up tent production completed but our factory is manufacturing tents for the earthquake relief in China so it may be delayed slightly. The estimated cost is below $200. This tent does not have a rain fly since the waterproofing level is 2000mm with taped seams and we feel that adding and removing the rain fly from the tent would make it less convenient. We have 2 of our pop up tent product brochures completed. Please check them out if you have a chance and leave us a comment. I have a pop up tent from a manufacturer that is no longer in business, and it's great but I want a new one that is taller. I am 6'2" tall and want a tent that I can stand up straight in. The previous manufacturer made several models with interior height of at least that size, but nobody seems to now. If your company made a tent that was tall enough for me to stand up inside, I'd be eager to buy one. The models shown look very nice but aren't tall enough for me. The nature of the pop up tent design does not allow for a tall tent. The reason that the other manufacturer is no longer in business is partly because they tried to make a pop up tent that was tall enough to stand in. The problem is the size of the frame rings that would be needed to make the tent that tall would have been so large that it would be unwieldy to fold up and too large to store anywhere. They tried to get around this by designing a tent that would pop up but to make the roof tall you had to add two shock rods diagonally from base corner to base corner of the tent and then attach a rain fly to complete the setup. So the set up was even more complicated and time consuming than a standard dome tent. In addition the tent was so unwieldy to fold up and store there were a lot of returns and the product didn’t sell very well. Our pop up tents are designed as true pop up tents that are quick set up and take down, weatherproof, and do not require the addition of other components to set up. Will it stay dry inside during a heavy rain ? Is there a built in waterproof floor? Will a 6'2" man fit comfotably inside the 2 man tent ? Are ther any pockets for keys, glasses etc ? Any hook or strap to hang a flashlight from? The polyester tent material that we use is rated at 2000mm which is very water repellent and all seams are heat seal taped to prevent leaking. The tent floor is made of polyethylene and is heat seal taped where it is sewn to the wall to prevent leaking. At 6'2", you should have a few inches at your head and feet where the tent material slopes inward. There are 2 storage pockets, one on each side of the tent, and there is a small loop at the inside center of the tent roof to hang items. Good question as ventilation is always a concern in tent design. We designed our XPP60-2 pop up tent with a breathable, 2 panel, screen roof underneath the rain cap on top of the tent to provide extra ventilation. The XPP60-2 also has a fully closable screened window on the side opposite the door to offer cross ventilation. Since we designed the XP3033 series pop up tents without a rain fly to make the easiest possible set-up, there is an arched window with fine mesh screening and inside zip close flap on the end opposite the door on these tents providing good cross ventilation. Will water collect on top of the XP3033 tents? Also, how does it stand up to windy conditions and how durable is the carry bag? The slope of the pop up tent roof will not allow water to collect on the tent roof. The patented spring steel 3 ring frame design makes the tent stable in the wind and in addition our pop up tent has guy rope loops and guy ropes included to stablize the pop tent in severe winds. The tent carry bag is made from heavy duty 150D polyester. I just got one deliverd and I am having a difficult time getting it to fit back in the bag. Any tips ? John, please follow the directions that are sewn into the pop up camping tent carry bag. Step 4 is the most critical to ensure that you tuck the upper portion downward and then inward towards you, and then slide the 3 rings that are formed over each other. We will be creating a video to help with this. Need a smaller version of this for Search and Rescue Operations. Wide on opening end for shoulders, narrow at other for feet. It also needs to be able to fit into a backpack or tie to it in a very small footprint. Anything over 24 inches in dia is to much, probably somewhere between 12 and 18 inches would work very good. To be used as an emergncy tent only. The orange vinyl tube tents sold on-line are trash. Is the pop up tent considered a three season tent? And do any of the pop up tents have a vestibule option? Interested in purchasing for use on wildfires. 2 questions: How durable is the floor material? We are not usually camping on a nice patch of grass. How much abuse can these tents handle? Our gear has been jammed into the back of truck, bottom of commercial airliners and tossed around in old converted school buses. This tent would be a God send after a long day. No one wants to fumble with tent poles in the dark. The floor material is rip stop polyethylene (like tarp material) with all seams taped. We use high quality material for these tents after gathering a lot of input from our customers on the field. Yes, you are right! After a long day, it is such a relief knowing you can set up a tent hassle free in no time! We sell to anywhere in North America. We only have offices in Phoenix and warehouse our products in other states so we do not have a showroom that you can view our products. Our products can be purchased online. I would like to purchase the one person version of the new design but I don't find the one person at your web site. I have several of the older models and use them all the time. We only have 2, 3 and 4 person pop up tents available for purchase. 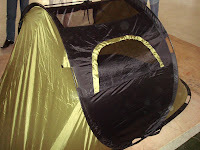 Compared to the older version, these tents have much better material and durability. Tom, glad to hear that you like our new pop-up tent design. We took our customer’s feedback seriously and worked hard to perfect this tent construction. Our new tent design will not work for a smaller fold up as it was made for a balance of robustness, performance features, and convenience. To fold up into an 18” diameter, the tent frame would need to be a much more flexible material but then you run into the problem of too much flexing and instability in the wind and materials that do not survive fold up cycle testing. However, as you can see with our unique tent designs, we believe anything is possible so, stay tuned and look for this as a future enhancement to our camping tent product line. I just received my new XPP60-2, and was delighted to find that it was as easy to pitch and strike as the videos make it look. I'm going camping this weekend, and I can't wait to show it off to my friends! Thank you so much for making my camping life easier. I'm considering the XP3033-4 but I'm still unclear about ventilation. It's fine to have a window on one end and a door on the other, but you wouldn't want them open in a rain storm. I'm considering a large tent so I can use a tent heater in it but I want to make sure there is enough ventilation for it and me. Thanks for your interest in our products. The door and window are the ventilation points. There is fine mesh screens underneath. You do need to open the zipper a little bit. We always look for ways to improve our products, and this is one of the improvements on our list for our next production. Due to the higher level of waterproofing material used in these tents, the material doesn't leak in the rain, however, you can get condensate inside the tent from your breath in the cold weather. That is the reason we ask our customers to open the window a bit , especially in a cold humid environment. I'm the one who posted at August 20, 2009 at 4:48 PM. One of the things I like about the rain cover on my current tent is that with the end of a tarp sticking out under the tent, and with the rain cover over the end of the tent, there is a small, enclosed, dry area where I can leave my shoes. I don't track in dirt when I leave them just outside the door, on the tarp, under the cover. Also, the rain cover allows for ventilation without opening a window or door. The top of the tent is mesh which the rain cover covers. So, I have good ventilation and it's rainproof. To set it up, all I do is spread out the tarp, pop up the tent, throw the cover over the tent, clip it to the tent on four corners, and stake down the ends of the cover. I also stake down ropes on the sides of the cover to hold it away from the tent a little for ventilation. It's very easy to set up. Please reconsider having a pop up tent with a rain cover. Thanks for your suggestion. We are in the process of testing a new improvement. The tent will be a screen tent itself with a full rain fly that can be installed with the vestibules on both sides. You will have the option to just use the screen pop up tent for maximum ventilation in the dry climate, or use the rain fly for rainy days. That sounds much better! In summer, I mostly use the rain cover for privacy when camping near others because the top half of my tent is screen. I look forward to your new tent. When do you expect it to be available? Will it be available in various sizes? I was real excited about these tents for an upcoming Alaskan fishing trip. I purchased the three man pop-up tent about a month or so ago. I used it this past weekend on a motorcylce trip to Kentucky. The tent set up was a breeze, everything I had hoped for. The weather however, was not. Rainy, damp and cold. From the get go this tent was problematic to say the least. It didn't outright leak, but built up thick condensation on the inside walls, that quickly permeated my sleeping bag, pillow and gear stored inside. After repeated attempts, to dry the tent out with heaters, it moistened back up throughout the day m aking for unbearable nights. I ended up sleeping in the bed of my F150 with a tarp pulled over the bed. If I could get my money back for this tent, please tell me how, it is the most awful piece of equipment I have ever purcahsed, and I am an avid outdoorsman with a fat pocketbook, so that is saying something, I buy alot of equipment! The tent is built to 2000mm water proofing, and all seams are heat seal taped to prevent leaking. 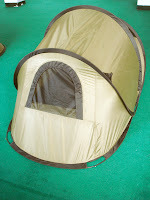 However, it is a three season tent and you can get condensate inside the tent from your breath in the cold weather. The design is a balance between simpleness of setup and functionality in four seasons. It is not suitable for cold weather environment. Grace, I understand, by cold it got down to about 40 degrees at night. If the tent is not made to handle that, what good is it really? We appreciate your comment. We have thousands of these tents in the field, and people love it. These tents are designed for its simplicity and waterproofing. I'm considering your 4 person pop up tent. In an earlier message you indicated that you were working on a version of your pop-up tent made of screen material, with a rainfly and vestibules. I would be very interested in this tent, rather than in your current design. Has production began on this tent? We are currently testing our new pop up tent design with a detachable rain fly and will not be manufacturing them until next year. Our new pop up screen tent design with a detachable rain fly will most likely be utilized on only our 2 person size pop up tent due to lack of demand for larger tents with this design. Of course we will keep manufacturing our current pop up tent design without a rain fly due to the huge demand that we have experienced for those tents. Does the 3 person pop-up tent get staked down? All of our Pinnacle pop up self erecting tents come with stakes. The spring steel ring that forms the bottom of the tent is held down by the stakes to secure the tent. All of our pop up tents also include guy ropes so you can secure the tent in high wind situations if needed. That's too bad that your pop-up tents will only be available in 2 person size. I already have a 2 person pop-up. I was hoping to find a bigger pop-up tent. I guess I'll stick with what I have from another company. Although, you give detailed specifications of the measurements of your tents, I'd like to see more descriptive photographs of how big the tents actually are. Maybe you could show a person in the photo to give it some scale. Purchasing the 4 person #XP3033-4. Maybe you could post photos of that? Also, is there a separate zipper for mesh screen? I got the 3 person tent & went to Catalina Island this weekend. Weather wasn't that cold but I got major condensation of water on inside of tent & my sleeping bag got wet on the corners since it was touching the tent. Everytime I touch the tent drops of water landed on my sleeping bag. The waterproofing on this tent is not great. Water inside the tent is often times mistaken for a problem with waterproofing but is actually, as you mentioned caused by condensation. In fact, the 2000mm hydrostatic test waterproofing on this tent makes it highly water proof but with this high level of waterproofing it also makes the fabric less breathable. In tent design, there is a balance between waterproofing the fabric and ventilation design to minimize condensation from people’s breath and perspiration inside the tent. Up to two quarts of water can be lost per person over night due to breathing and perspiration. This is equivalent to throwing over a gallon of water inside your tent each night. On nights with high humidity and cool temperatures, this water vapor can condense on the inside of the tent, like it does on the inside of the windshield of your car. Since we don’t have air conditioning to dry the air like in a car, we have added protected vents at the top of the sides of the tent to minimize condensation. On cool humid nights it still may be necessary to open the zipper a little bit on each window to allow better air flow for the escape of all that water vapor that is breathed out. Kevin, we purchased a Pinnacle tent a year or so ago and although we LOVE the quick set up...we have had some serious issues. When you first open the tent and lay it down in the star pattern, the rain fly is constantly getting caught in the circular base. We didn't know about this when we bought it and the first time out, the rain fly tore, a VERY expensive lesson indeed. We still use the tent but needless to say we are disappointed. Every time we use it we must carefully pull the fabric out of the center before pulling it up. I'm not sure we want to "experiment" with a newer model. Your tents are not cheap. Keep plugging away though. The idea is genius and perfect for a mom like me. What I meant to say on 6/04/10 was that it's too bad you are only making a pop-up tent with a rain cover in the 2 person size. I'd like a 4 to 6 person pop-up tent where the tent top is mesh for good air flow (no condensation) and there is a rain cover. (For privacy and rain protection) It would also offer a vestibule where I could leave my shoes outside the tent (for less dirt in the tent) but in a covered place.